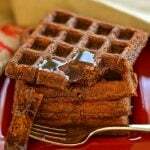 Add some sugar & spice to your life with these deliciously dark, rich & fluffy waffles. Full of warm & comforting gingerbread flavour & surprisingly healthy! Grease and preheat your waffle iron. I used setting 4 on my Cuisinart Waffle Iron . If you don't have a waffle iron then use a non stick fry pan and make them into pancakes. Put all of the dry ingredients into a bowl and stir well. Put all of the wet ingredients into a jug or bowl (one with a lip is easier to pour). Stir until well combined. Pour the mixed wet ingredients into the dry ingredients and mix using a spoon, until just combined. Do not over mix. A few small lumps are fine. You just want it to get to the stage that you can't see any dry bits of flour through it. The batter should be a thick dropping consistency, kind of like thick cake batter. If it feels too thick, add an extra tablespoon or two of milk at this stage but don't make it too thin. When your waffle iron is ready pour in your mixture and cook on a medium temperature until steam stops coming out of the side. As soon as it does remove them. Ignore any signals from your machine if it tells you they are done earlier. When ready open your waffle iron carefully and remove. If making as pancakes pour the batter into the pan and cook over a medium heat until bubbles start forming on the surface. Once you see bubble flip and cook for a minute or two more. These waffles are best served immediately but they also keep well in the fridge for a few days or in the freezer for a few weeks. Just warm them through in a toaster straight from the fridge or freezer before serving.